Help us shape the OEV Dundas Street Corridor Secondary Plan. A secondary plan works as a part of the official plan (The London Plan) and contains policies and land use designations that are more specific in nature and apply to a contiguous area. The purpose of the Old East Village Dundas Street Corridor Secondary Plan is to build on the policies of The London Plan and to provide more specific direction for development and projects within the study area. 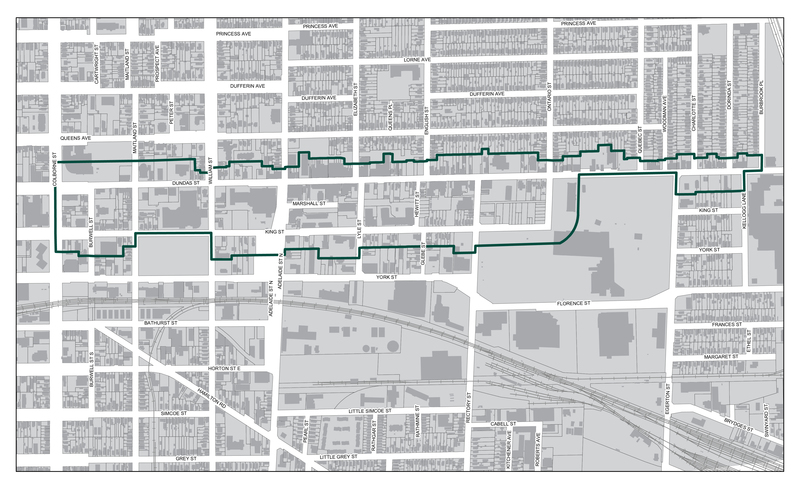 This land use policy, once adopted, will direct future development within the secondary plan area (shown below). What other projects are happening in the area? The secondary plan study will take into consideration the future outcomes of these projects. Who is undertaking the secondary plan study? City Planning has retained Urban Strategies Inc. to undertake this study and is working closely with Transportation Planning and Design as well as WSP to incorporate the results of the East-West Bikeway Evaluation into the policies of the secondary plan. How do I stay informed on the secondary plan study? Check this website occasionally for updates. As the project progresses, we will be posting new information. If you would like to receive email updates, please contact Kerri Killen at kkillen@london.ca and ask to be added to the notification list. The Draft Old East Village Dundas Street Corridor Secondary Plan is now available to download. City Planning staff will be gathering your feedback on the draft Secondary Plan and refining the policies in the coming weeks. Please see the “Provide your feedback” tab for information on how to submit your comments. If you have comments or questions about the Old East Village Dundas Street Corridor Secondary Plan that are not related to cycling infrastructure, please email kkillen@london.ca. If you have comments or questions specific to the Downtown OEV East-West Bikeway or cycling infrastructure, loading, and on-street parking on Dundas Street, please email agiesen@london.ca. How do I find out more or submit comments about the Downtown East-West Cycling Feasibility Study? Transportation Planning and Design has retained WSP to undertake the Downtown East-West Cycling Feasibility Study. You can find out more about this project and submit comments through the project webpage. Second community information meeting to present and gather feedback on the draft Secondary Plan policies and East-West Bikeway Evaluation recommendations. Provide opportunities for additional feedback; revise the draft Secondary Plan based on the feedback received. Present the draft Secondary Plan to the Planning and Environment Committee. Third community information meeting to gather feedback on the draft Secondary Plan policies.